Preheat the oven to 350 degrees F. Spray 6 or 7 muffin cups with nonstick spray. After you cook the sausage, scoop it into a paper towel-lined bowl to drain and cool, then wipe out the pan with a paper towel. Quickly cook the spinach in the same pan, just until wilted. Let it cool, then squeeze any excess moisture out of it. In a medium bowl, whisk together the cooled sausage and spinach with the eggs and milk. Scoop into the prepared muffin tins (I find it easiest to use a 1/3 cup measuring cup) almost to the top. Sprinkle cheese on top. Then give each one a good dose of salt and pepper. Bake 25 to 30 minutes, or until egg is cooked through. Easy way to check the egg: touch the middle of the muffins… if they are still wet and gooey, they’ll need a little more time in the oven. They should feel cooked through. Serve egg muffins immediately- with salsa, if desired. 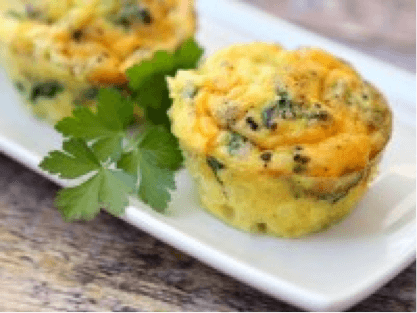 *Egg muffins are pretty versatile- sub in other ingredients for the sausage and spinach, if you prefer.